Sure, Iceland has a rich history to explore with all its Saga plots, but with its wonderful nature, Iceland is the perfect spot to do something more adventurous. Check out some adventure inspirations what to do while exploring Iceland. If you are an active person then Iceland is a perfect travel destination for you. Following I will give you some ideas what Iceland has to offer to spice up your ring road trip. Please always keep in mind: Iceland has a gorgeous nature giving you a nice play area. But you are always responsible that it also stays that way! 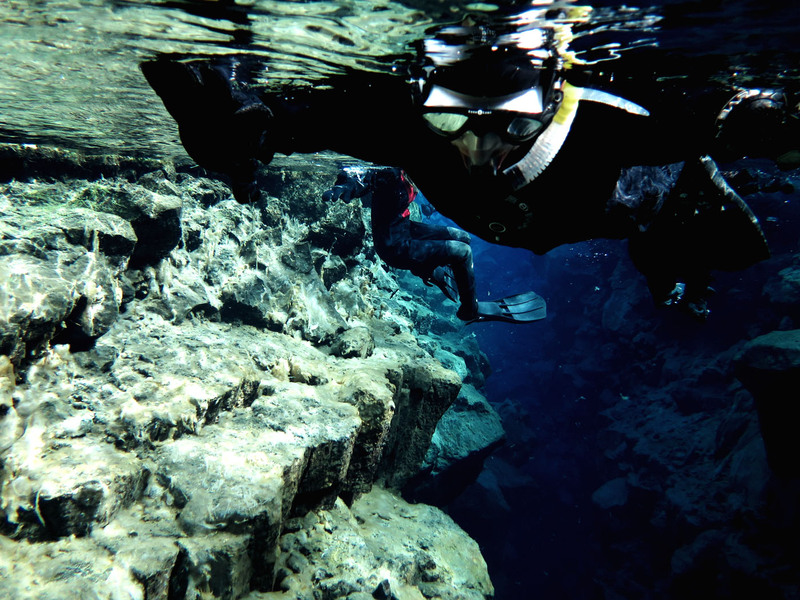 I mean, where in the world you get the opportunity to go snorkeling between continental plates? Frankly, I do not know much about snorkeling, but I guess, there are not too many spots you can do that! And, after you survived 2° C cold spring water you can be very proud of yourself. Another good thing about snorkeling in Icelandic inland waters: They are one of the clearest and therefore you will have the impression you’re simply flying over everything beneath you. And if you’re thirsty afterwards, you just can drink directly from the spring – the best water in the world, fed from Langjökull glacier. Although it is a very unique experience, it is also rather one of the more expenisve ones. Sorry, folks, Iceland was, is and always will be one expensive island. But it is worth it! Driving ATV’s or buggies in Iceland is much fun. Its rugged terrain and wild nature offers the perfect scenery to speed around with these little power packs. I had the pleasure to bomb down fjords, lava fields and black beaches, speeding through creeks and mud pools. If I had to choose between buggy and ATV, I would go for the buggy as you can drive a tad more agro as seat belts will keep you in place. 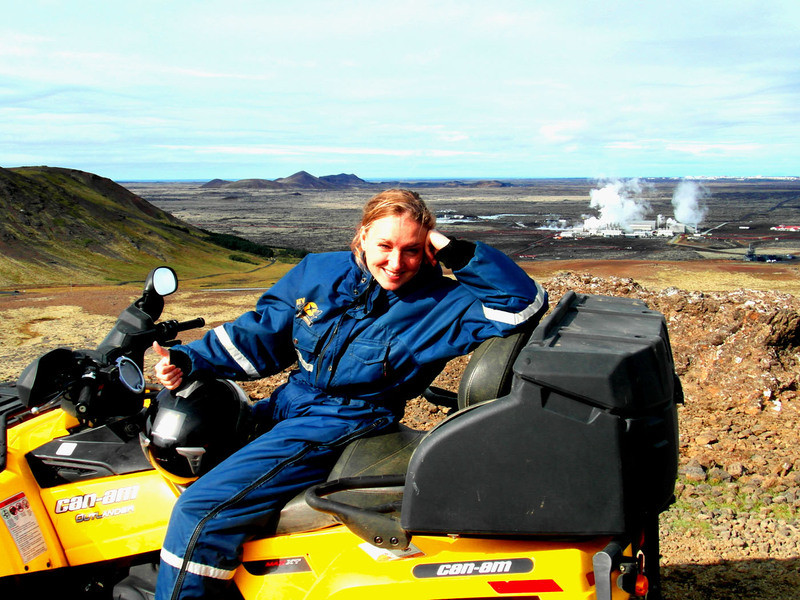 The last time I was driving ATV with my Dad near the Blue Lagoon (that’s the steamy spot behind me on the picture) I almost got knocked out of my seat while driving downhill and one of the edgy lava stones kicked against the axis. But both ways will work to raise your adrenaline bit. Horseback riding – of course! The fluffy, four-legged trigger I am as crazy about Iceland as I am, is the Icelandic Horse. And to ride them in Iceland is definetly the best way to explore this amazing nature. 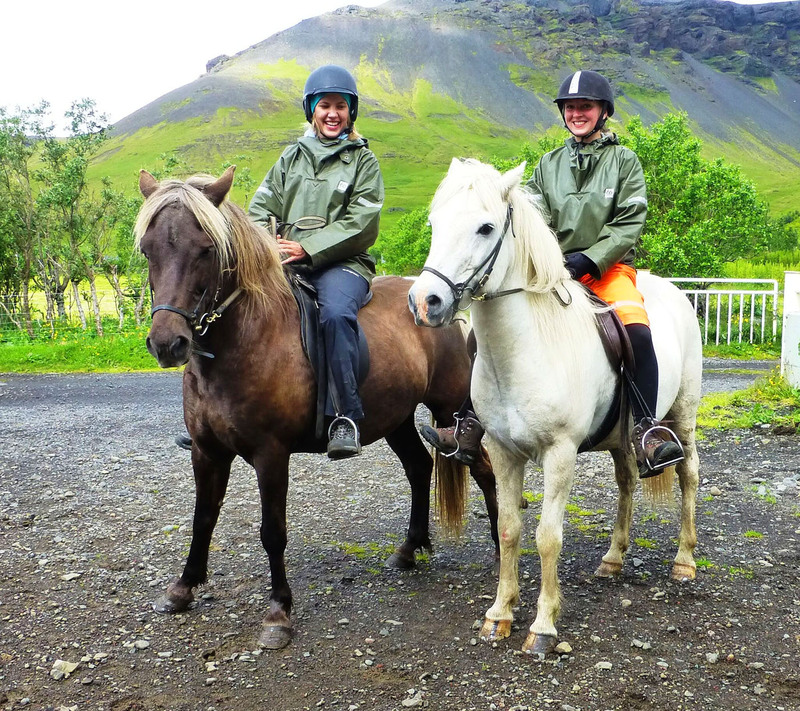 Horseback riding is maybe also the most authentic way to travel through the country as the Icelandic Horse was the main mean of transportation until recently. If you now recall your last lame, touristy ride somewhere on a Western Ranch or a bland Andalusian farm – no worries, Icelandic horses (don’t call them pony!) are so much fun. They are enduring, friendly, curious, sure-footed and you will have a sightseeing of Icelandic nature beauties while crossing rivers, climbing hills and chasing sheep. Or, you just can galloping trough all that like my friend Lena and me did – you’ll be exhausted, but happy! 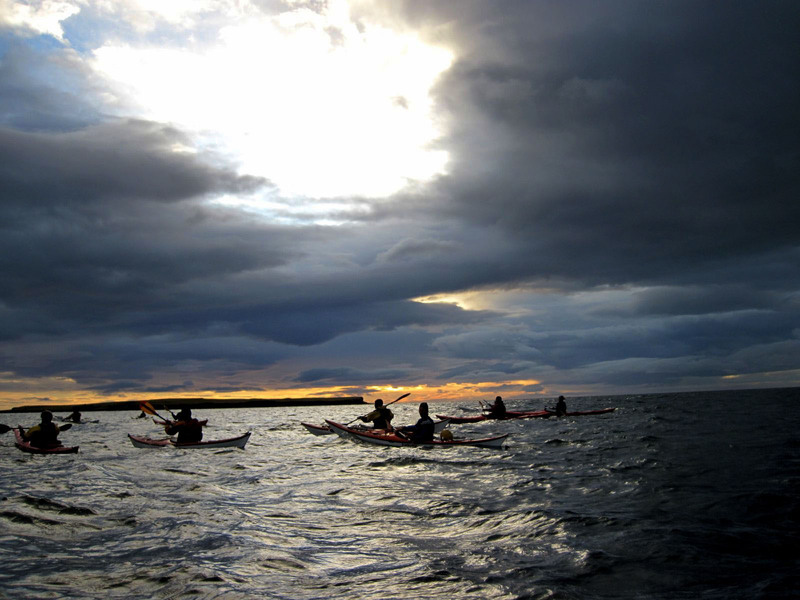 Iceland has a total coastline of almost 5.000 km – and therefore enough opportunities to go sea kayaking. It is maybe one of the most authentic activities you can do in Iceland. Not, because the kayak was one of the historical relevant means of transportation (unlike the Icelandic Horse) rather as it is so close to one of the most present elements in Iceland: Water. This time in terms of the North Atlantic. I was blown away by the perspective you get by of the Icelandic landscape. As if it isn’t stunning enough traveling along the road, from the point of view from the ocean while sitting in a kayak is just another level of impressive. You will see Reykjavík and its skyline in a totally different light. And sunsets like the one you see on the picture are just most breathtaking while feeling the ocean waves beneath you and the smell of salt in your nose. Check out the guys at sea kayaking. If you are a bike-person Iceland will surprise you with its perfect mountain bike areas. Mountain biking is currently a huge trend amongst Icelanders. You see cars with fancy, expensive mountain bikes on roof racks everywhere. Please do me a favour and do not think Iceland is a perfect spot to go for a racing bike trip. It is definetly not. Streets are not in very good condition (especially roadsides), the arctic wind is a P.I.A. and there are (almost) no alternative routes for bicyclists. Road #1 is packed with all the traffic which is passing Iceland: Tourists on tiny rental cars, locals on monster jeeps, Jón Gunnarsson on his tractor as well as all the goods traffic the nation has to wind up. Don’t forget the sheep and every now and then a run away cow or a horse round-up. All the time I see people traveling with a track bike or even a race bike on road #1, they look fed up and as they are trying to simply survive than enjoying their trip. On the Westfjords I almost ran over a bicyclist who appeared out of nowhere from the milky mist. 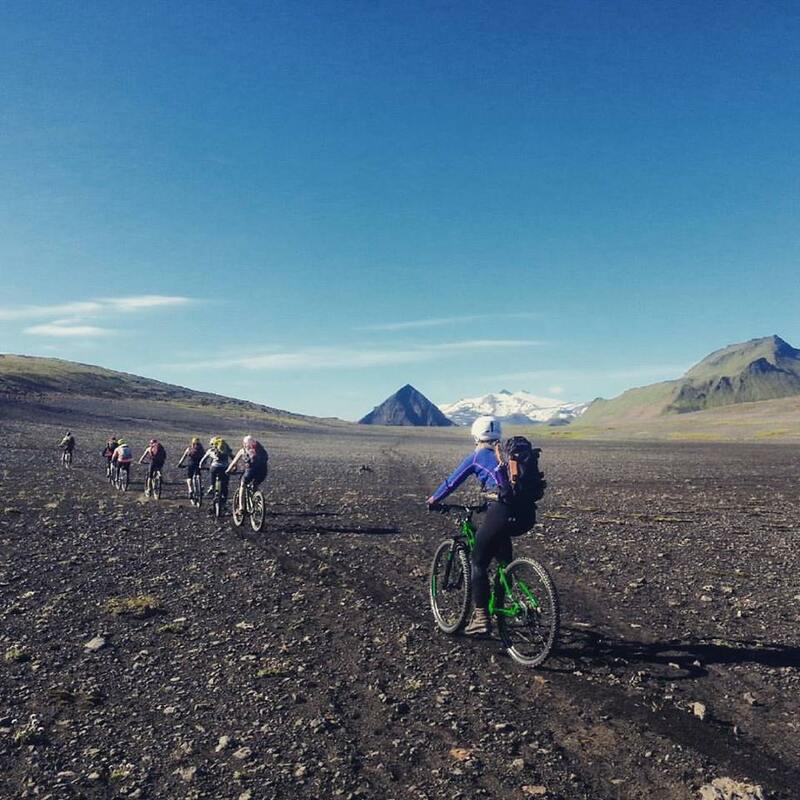 Rather switch to mountain biking as Iceland is full of stunning moon landscapes like Laufafell, where you will have a lot of space to bike around as you please. If you are a rather unexperienced biker, especially in Icelandic conditions, check the guided tours of Iceland Bike or Bike Company. It is maybe the only possibility on earth to visit mother earth’s kitchen, means a real magma chamber. 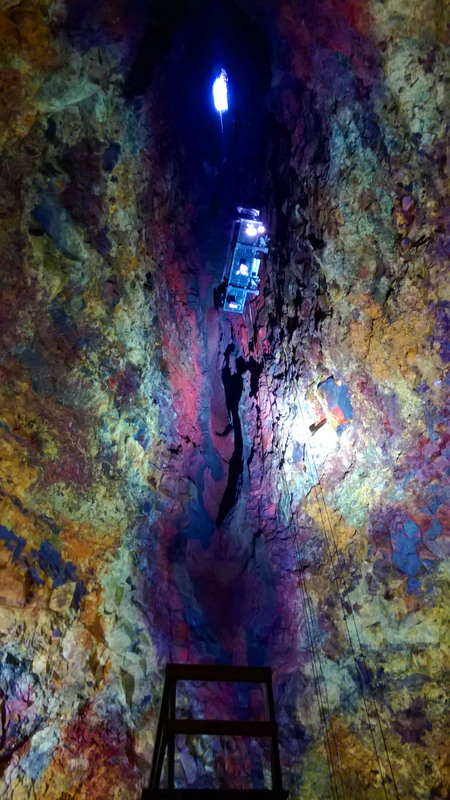 After a beautiful hike of about 30-40 minutes over old, moss covered lava fields as an introduction you literally go inside a volcano with a tiny elevator, 100 m deep into the chamber. You will be overwhelmed by the beauty you’re about to see. To be honest, I didn’t expect such a charm inside a volcano. The colours created of the different chemical reactions during an eruption are blazing. Although it is unbelieveable to imagine the power and heat which are involved in such process, you will perfectly get an idea of how big everything is. As Iceland is literally a lava island in the middle of the Atlantic, it is a perfect themed excursion. But be warned: As sizzling as it might was during the eruption in this chamber as hot is the entrance price of 40.000 ISK – you might burn your whole travel activity budget in here. Well, I admit: A glacier hike is pretty cool. Not to say amazing. Long time I refused to ever go on a glacier hike. Why? Because literally every tourist is doing it. Or at least, when working in the tourism industry it feels like every single person, who is travelling Iceland is doing it. Furthermore I pictured it as bald walking on white, snowy ice. As we got loads of loads of this already everywhere in Reykjavík everyday life and I still suffer from snow madness flashbacks, I wasn’t thrilled. So, why bother and go on a glacier hike for that. I was mistaken. When you step on that smooth, deep blue, artistically shaped thousand year old ice, it is solemn moment. Do it in winter, then the ice appears more blue than in summer. Try to pick a time when it isn’t that crowded with fellow-traveller as this can quite ruin the atmosphere – a glacier in a rush-hour is a rather awkward than unique experience.